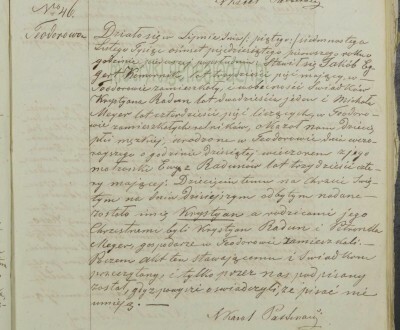 As you know since many years our wonderful volunteers have been helping you to translate your Polish (and of course also Russian and Latin) records. They are here for you almost everyday, spending hours on reading, deciphering, translating and explaining you the historical background. As our community here is constantly growing (and this is great!) automatically there is much more translation requests than it was before. Please let's respect our translators' time and work. 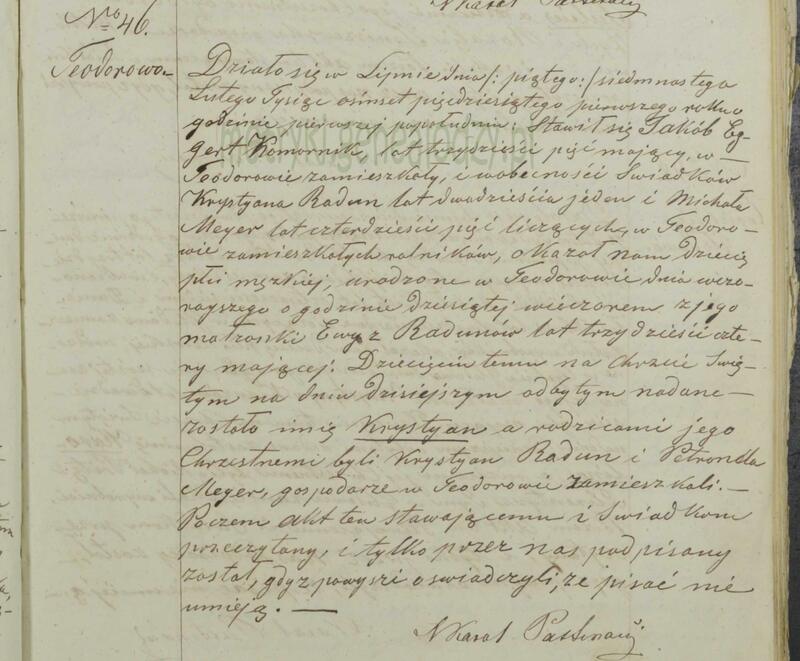 With the help of our other members I have found perfect manual and template how to read and translate the Polish records on your own. It is prepared by Family Search http://familysearch.org . Sometimes you just need find the name of the person on the record, sometimes you are looking for the date or place name to check if the record is related to your family history. Please: try to deal with this on your own firstly and then ask for help with problematic, difficult records, or those that you are 100% sure that are your ancestors. Remember: practice makes perfect! Most of those records are using the same matrix, so the more you read, the easier it is for you. Here are the 3 instructions: How to read Polish birth, marriage and death records from Family Search. You can add here other websites and materials that you find useful. I wish you good luck, a lot of patience with practicing and most of all satisfaction and joy of discovering new information! Thanks much for everyone's help with translating. I finally took the plunge, finding a Polish record with apparently readable cursive, I read all the "How To" instructions. Got my text editor, Word List, Google translate, and the Polish record all up on my screens. If I couldn't find the word I read, from the Word list, I'd use my very flexible editor and search on a group of 3 or 4 letters I was sure of and finding all words matching those, then pick the most likely Polish word from several in the word list. It still wasn't good enough. I found the scribe sometimes used word forms that weren't in the Word list. Sometimes he'd added a simple 'e' to the end of a word, other times I'd make a mistake interpreting letters in the read word. For instance; Polish 'l's with a slash looks much like his 't's, 'r' looked like 'v' or 'n', an easy correction was the 'e' with a hook - it looks like a 'g' ..
After too many hours, I got most of the record translated, but some words I thought I got were just garbled and made no sense via Google translate. What I suspect, Google could be expecting 'modern Polish' and I'm feeding old Polish, abbreviations, "slang" words, or old fashioned ways of writing that doesn't translate well. Here's what I have, with underlined words either; wrong, unknown to google, or making little sense in translated context. Take a look at 5.3 in https://www.familysearch.org/wiki/en/Poland_Civil_Registration. It was there I learned how to read these records. You did not do badly in your attempt. The only thing you seem to be having problems with is reading the handwriting. Sometimes what appears to be two words is actually only one word...just the way the scribe’s method of writing. Sometimes we do the same thing in English. Not many of us write as we were taught in grammar school as we get older. The Polish vocabulary and grammar is very much the same as today’s vocabulary and grammar. The difference between the way the scribe writes the letters t and ł is that the diacritic on ł appears high on the letter (not as it does in a typed version) and the t is crossed lower on the letter. I’m not really sure how to help you read the handwriting. 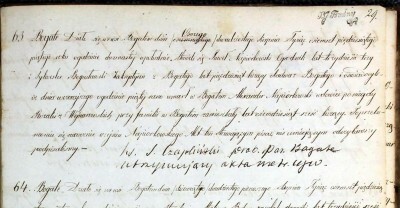 In many ways, it is something that comes from experience of reading handwritten documents and in other ways it is just something that happens automatically for someone familiar with the language. I know that doesn’t really help or console you, but don’t give up. I’m not sure what Google translate will do if you type in the transcription below, but give it a try. I’ve seen some really weird stuff come out when individuals have tried to get Google to translate from Latin to English. This leads me to believe that Google has a hard time dealing with inflected languages like Latin and Polish. A couple of hints...1. Don’t sweat the words immediately following the day and the month at the beginning of the record. They are only the year written out in words and you already know the year from where you found the record. 2. The last sentence is not important. It just states that the record was read to the informant and witness, who are illiterate and was signed only by the scribe. When you find a record where the informant and/or witnesses are literate, you’ll see their signatures at the bottom of the entry. No signatures...the last sentence is just the usual formula. Keep trying and it should get easier and less time consuming with each attempt. Here is a transcription of the record. Działo się w Lipnie dnia/ piątego/siedmnastego/ Lutego tysiąc ośemset pięcdziesiątego pierwszego roku o godzinie pierwszej popołudniu: Stawił się Jakób Eggert, komornik, lat trzydzieści pięc mający w Teodorowie zamieszkały, i w obescności swiadków Krystyana Radun lat dwadzieścia jeden i Michała Meyer lat czterdsieści pięc liczących w Teodorowie zamieszkałych, rolników, okazał nam dziecię płci męskiej, urodzone w Teodorowie dnia wczorajszego o godzinie dziesiątej wieczorem z jego małzonki Ewy z Radunów lat trzydzieści cztery mającej. Dziecięciu temu na Chrzcie Swiętym na dniu dzisiejszym odbytym nadane zostało imię Krystyan a rodzicami jego Chrzestnemi byli Krystyan Radun i Petronela Meyer, gospodarze w Teodorowie zamieszkali. Po czem akt ten stawającemu i swiadkom przeczytany i tylko przez nas podpisany został gydz powyszi oswiadczyli ze pisać nie umieją. Thanks so very much .. I have no problems with Google translating recent Polish postings, they read smooth. These older deciphers often show oddly stilted phasing, which is why I suspected 'old' vs 'newer' Polish idioms at play. Yes, my first attempt - and I do realize that baby steps at first and eventually we get there. one. word. at. a. time. But it was frustrating getting so many weird results and so many words not found. I *WILL* be using your explanation along with your deciphering of the Polish to help me on future translations (I have so many documents, it'd be embarrassing to keep asking for help). If I come across other Polish word lists, I'll point them out..